The decision taken today to shift the main area of search to the west for the missing flight MH370 of Malaysia Airlines may be the first major step in the right direction to solve the puzzle of the lost plane. Looking more intently at places other than South China Sea is a wise move. But if the search parties continue to ignore the land mass of peninsular Malaysia, the final answer to the puzzle could evade them further. Because, by all probabilities, the crashed aircraft would be somewhere in the forests in the districts of Terengganu or Kelantan in peninsular Malaysia. Actually, from day first itself, there were ample indications for this. The radar of Flightradar24 had plotted the path of the aircraft only up to the point of Lat: 6.97 & Lon: 103.63 in the South China Sea area around 1.41, Saturday morning. At that point, the elevation was 35,000 feet, Airspeed 471 knots, track 40 degrees. MH370 simply vanished next second. The location was South-East of Thochu Island and between the Marang coast of Malaysia and the cape of Ca Mau of Vietnam. By 8th morning, with news of the missing flight spreading fast, the images of this plotted path as captured by Flightradars24 too had been shared by many. But Malaysian Air Force soon released the path of the same aircraft from their own radar. That was a little longer. And it was seen in that the plane turning almost 180 degrees to align with track 230. After the turning, the plane vanished from the military radar too. Today there are reports in media that MH370 may have turned around. FR24 have not tracked this. This could have happened if the aircraft suddenly lost altitude as FR24 coverage in that area is limited to about 30000 feet. 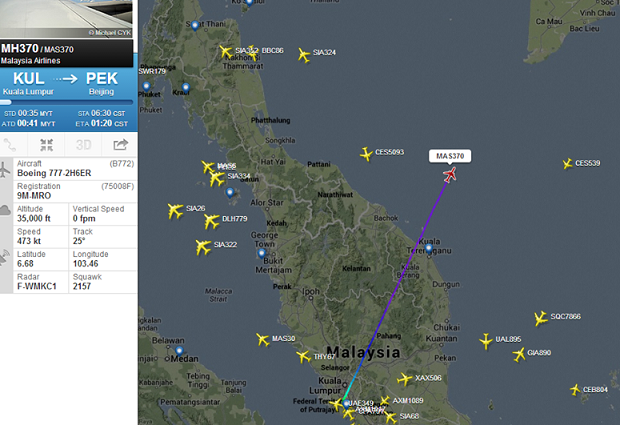 FR24 have not tracked any emergency squawk alerts for flight MH370 before we lost coverage of the aircraft. So there was a sudden loss of altitude, just before the aircraft taking the U turn. Why the drop and why the drastic turn? Reasons could be many. Encountering a sudden turbulence and falling in an air pocket could be one explanation. The fall could have been be so severe that it reached some 20,000 feet within seconds. The drastic drop might have damaged the very structure of the aircraft and many passengers aboard would have suffered injuries. Assessing the severe damages to the plane and considering the passenger injuries, the Captain would have decided to go back home- for an emergency landing. By then the integrity of the fuselage too could have been compromised. Rapid depressurization would have necessitated loosing altitude further. That explains the vanishing of the plane from air force radar after the turn. The turn and fall could also because of some hijacker demanding that. But the hijackers-on-board theory has been discarded by now by the Interpol and the Malaysian Police. It may be remembered that Marang and Pulau Kapas are exactly along the plotted flight path of MH370. Note the ‘loud noise’ and the direction ( ‘from Pulau Kapas’) from which that came. It is obvious that, the plane, having turned towards the land of Peninsular Malaysia, flew past the villagers at a low altitude, in the direction of Kuala Lumpur. But why there were no communication to the ATC? 1. The pilots could have been be too preoccupied with getting things under control. A damaged fuselage, severely injured passengers, and failing/failed systems. 2. Time was too short. The aircraft eventually crashed a few kilometers away. But is it possible for a crashed aircraft to go unnoticed by the villages for four days? The answer to this question is the crash of Kenyan Airways flight 507 , a brand new Boeing 737-800 in the night (01:06 local time)of 5 May 2007. Immediately after take off from Douala International Airport, Cameroon, the plane crashed in to a small forest just 5.4 km away from the end of the runway. (It was established later that a series of errors committed by the pilots had caused the crash) .The plane hit the ground almost vertically, nose first and by the force of the impact, considerable length of the fuselage penetrated deep in to the swamp. All 114 on board were killed. The signals emitted from the craft were so mangled that, all the search for the craft were concentrated in an area 120 km away from the runway. It was almost after two days, by the evening of May 7, that a hunter accidentally spotted the crashed plane in the forest. All the other possibilities like terror attack, hijack or mid air disintegration etc. have been eliminated by now : The passengers with stolen passport were kids with no crime records or terror connections; The plane had not landed at any airport/airstrip and there were no communication by possible hijackers; no widespread debris could be found neither on land or in sea. So the only plausible explanation remaining is a crash on land away from populated areas. And this provides a satisfactory explanation to something else also: The reported ringings of the mobile phones of many passengers even after two days of the disappearance of the flight.